In the search for the world’s best breakfasts, the Eggs Benedict at La Posada de Santa Fe are a winner. Some of the world’s best breakfasts attain that status not only because they are tasty and beautiful presented, they’re also healthful and nourishing. With his signature “Global Latin” style, New Mexico’s Chef of the Year Carmen Rodriquez has whipped up a unique breakfast menu at La Posada de Santa Fe Resort & Spa that is a fusion of classic Northern New Mexican and American fare. The extensive and tempting breakfast menu includes such other options as Tres Leches Pan Perdido (French toast) and Huevos Rancheros (fried eggs Mexican-style) with red and green chili sauce on the side. I opted for the Skinny Minnie Bennie—trying to start the day off right. 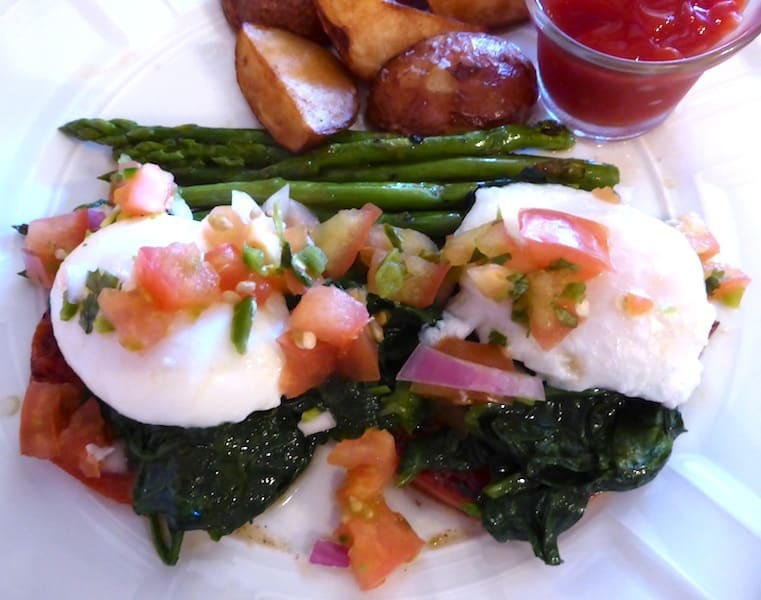 This creative one-off Eggs Benedict dish features two eggs poached on top of steamed spinach on a plate with asparagus and grilled tomato slices, topped with zesty pico de gallo (sometimes called salsa fresca). Substituting two beds of spinach for the classic English muffins makes the dish is a bit less calorific, and is just as easy to make at home. Of course, the unique setting was Santa Fe style, too: This choice for the world’s best breakfasts was served at the resort’s Patio Restaurant on a sunny outdoor patio under a brilliant blue sky shaded by bright red umbrellas. When the air is chilly, the wait staff can fire up the adobe kiva fireplace and turn up the heat lamps. This post is part of a link-up on Marcia Maynes’ Foodie Tuesday. The Eggs Benedict dish looks perfect for me. I love classic Eggs Benedict (and creative versions), but I’m so often disappointed in restaurants that I’m reluctant to order them. But if I get to La Posada de Santa Fe, I’ll order them without hesitation! What a sunny and cheerful place to have a meal! Your breakfast looks attractive, delicious and nutritious. Bon appetit!